The Supreme Court held that Section 14 of the Insolvency and Bankruptcy Code, 2016, which provides for a moratorium for the limited period mentioned in the Code, on admission of an insolvency petition, would not apply to a personal guarantor of a corporate debtor. Upholding a Delhi High Court judgment which held that moratorium under the Insolvency and Bankruptcy Code (IBC) will apply to the order of Income Tax Appellate Tribunal, the Apex Court observed that IBC will override anything inconsistent contained in any other enactment, including the Income Tax Act. The Supreme Court held that the mere fact that the driving licence is fake, per se, would not absolve the insurer and it can only be absolved if it is found that the owner was aware of the fake licence and still permitted the driver to drive the vehicle. The bench of Chief Justice of India Dipak Misra and Justice AM Khanwilkar was considering an appeal (Rama Chandra Singh vs. Rajaram) against Allahabad High Court order that had absolved the insurer merely on the finding that the driving licence of the driver was fake. Interpreting Section 4(6)(b)(ii) of the Payment of Gratuity Act, the Supreme Court held that forfeiture of gratuity on the ground of misconduct which constitutes an offence involving moral turpitude, is permissible only if he is convicted by a court of competent jurisdiction for the said offence. The Supreme Court held that in cases where protection under the Rent Act is available, no eviction can be ordered unless ground seeking eviction is made out, even if parties had entered into a compromise. The Supreme Court on Tuesday restored a trial court order that acquitted an accused in an NDPS case, on the ground that the oral evidence adduced that the contraband was produced before the magistrate cannot form the basis to record the conviction, in the absence of the order of the magistrate to that effect. The Supreme Court, while upholding the constitutionality of educational/domicile requirements in Assam MBBS/BDS Admission Rules, observed that it is permissible to lay down the essential educational requirements, residential/domicile in a particular state in respect of state quota seats for basic courses of MBBS/BDS/Ayurvedic. In a relief to ad-hoc judges who were battling with the Madras High court claiming retiral benefits, the Supreme Court held that they are entitled to it and directed it to be computed and paid to them within a period of two months. Worried about the air pollution situation in Delhi, the Supreme Court directed that hologram-based colour code stickers be put on vehicles for identification of type of fuel being used—light blue for petrol/CNG and orange for diesel vehicles. The Supreme Court directed all Legal Services Authorities/Committees in every State to extend video conference facility between the counsel and the accused or anybody in the know of the matter in every criminal case wherever the accused is lodged in jail. 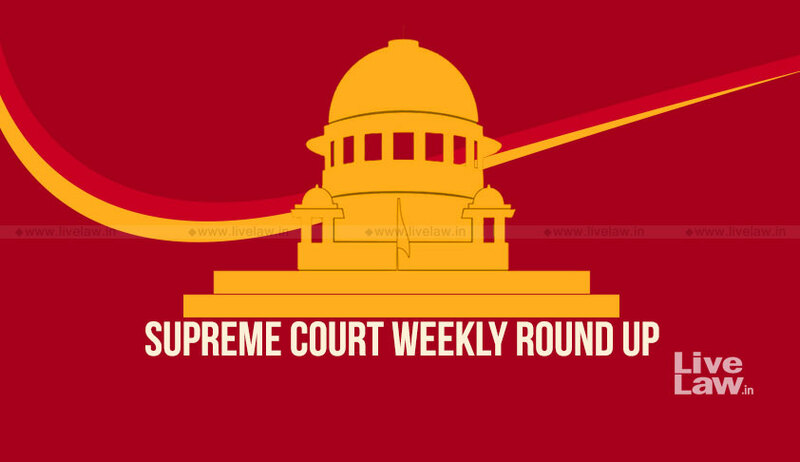 The Supreme Court on Monday issued notice to the state of UP in connection with the June 18 Hapur Lynching incident which resulted in the death a Muslim meat trader. The bench of Chief Justice Dipak Misra, Justice D. Y. Chandrachud and Justice A. M. Khanwilkar was hearing a writ petition by one Samaydeen, who had witnessed and also faced attack in the course of the same unfortunate episode. Plea For Citizens’ Charter And Grievance Redressal Commission: SC Asks Petitioner To Approach Govt.